Fundraising for this project has ended! Contact us at savethedrop@utexas.edu for inquiries, proposals, or comments. 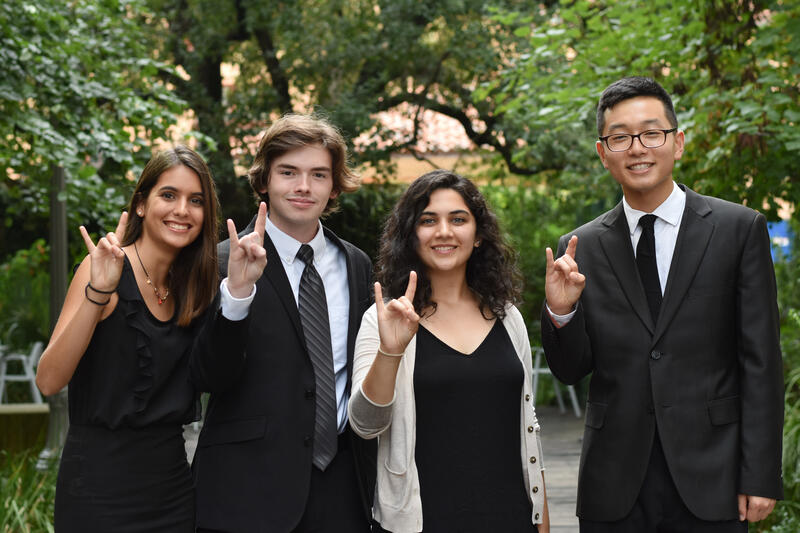 Project Oasis began as a research initiative under the President's Award for Global Learning, and has evolved into a friendship between 4 passionate students that are intent on changing the way water is viewed in Texas. Together, we speak 11 languages, represent 6 different majors, and our supporting faculty have over 40 years of experience in the subject! Throughout our sophomore year, we researched the realities of water conservation in Texas and the Negev Desert of Israel, seeing an opportunity for Texas to learn and improve. We are currently working alongside topical and regional experts, Dr. David Eaton of the LBJ School of Public Affairs, Dr. Molly Polk and Dr. Kenneth Young of the UT Department of Geography and the Environment. In the past year, we have also accrued a large following on social media as part of our campaign to raise awareness and educate Texans on the importance of water conservation. The U.S. consumes more water than any country in the world, and Texas is the second highest consuming state. From 2010 to 2014, Texas experienced its second worst drought in history. By the end of 2011, the state “transitioned from virtually drought free to exceptional statewide drought.” To this date, drought is a yearly occurrence. If Texas does not improve its methods to conserve and reuse water, the Texas Water Development Board predicts shortages will cause over 424,000 job losses and $73 billion in lost income between now and 2020. That is not to count the millions of trees lost, lakes drained, and local farms bankrupted. What Are We Doing in Israel? Israel leads the world in water conservation, with its sandy deserts being the birthplace of drip irrigation. Even in the Negev Desert, one of the driest places on Earth, crops thrive due to exceptional practices. Project Oasis aims to study what motivates Bedouin and Israeli communities to adopt best water practices and research the underlying roots of a water-conscious culture. Working with our international partner, Ben-Gurion University, we plan to travel to the Negev Desert, interviewing local officials and residents, conducting focus groups and surveys, and studying local traditions and policies regarding water conservation. We hope to learn how to motivate Texans to similarly excel at water conservation. The Negev resembles Texas in numerous ways, through an environment similar to West Texas and the Panhandle, local control of water supplies, and a fortuitous people. However, unlike Texas, residents of the Negev are often far more efficient with far fewer resources. We hope to change that by publishing our multidisciplinary research, presenting our findings to think tanks and governments, and consulting local businesses and individuals on best practices to improve water conservation here in our home state. From the bottom of our hearts, thank you for spending time to learn more about our project. We are passionate about improving water conservation across the state of Texas and the world. Through generous grants and private donations, we have already been able to raise over half of the funds necessary to make this project a reality. Please consider making a tax-deductible donation today to help the future of water availability in Texas. A small gift can go a long way, so please donate today! If you can't make a donation at this point, help us reach our goal by sharing this page on Facebook, Twitter, or any other social media. Or, even better, send an email to friends or family you think might be interested in contributing and include a link to our page! We appreciate your help and generosity; it means everything to us! 20% of all water in Texas is lost to leaks every year. That's millions of gallons a day! Your donation can help prevent these leaks! According to a Lower Colorado River Authority study, drip irrigation decreased the amount of water needed for rice farming by 58%! There are 2.24 million speakers of Bedawi Arabic in the world! Bedouins are known as a nomadic people, traversing the area of Egypt, Israel, Palestine, Jordan, and Saudi Arabia! 424,000 Texans are expected to lose their jobs between now and 2020 due to drought, according to the Texas Water Development Board. Your donation can help protect these jobs! The Negev Desert contains the Dead Sea, the lowest point on Earth at 1,368 feet below sea level! Our partner organization, Ben-Gurion University, was founded in 1969! BGU is the 5th best university in Israel and a leading research university for water conservation across the world! The highest point in the Negev, Mount Ramon, stands at 3,402 feet! This area is known for some of the best stargazing in the world!